Maybe you really don't need a webcam. Maybe you just need one for a short use or specific use? PixWebcam turns any iPhone, iPad, or iPod touch into an ad-hoc webcam for taking photos in definable intervals. Photos are then uploaded to various channels like Dropbox or Twitter. PixWebcam can be used to capture events and activities, like setting up a piece of furniture or a birthday celebration. Or it can track the weather over a longer period of time. The interval at which photos are taken can be specified from 1 minute up to 12 hours. Photos are then copied to one or several supported target channels. Photos can be customized by changing the size and aspect ratio, adding a date/time stamp, or by adding a custom caption text. Language Support: PixWebcam is localized for English and German languages. 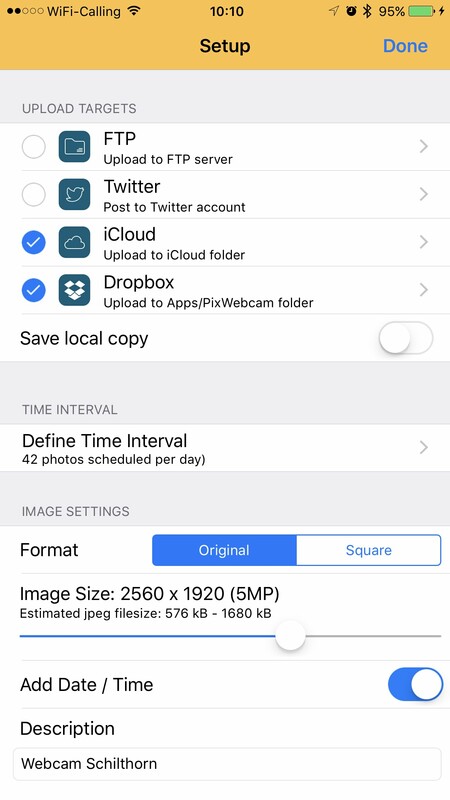 Pricing and Availability: PixWebcam 1.0 is a $0.99 (USD) download available worldwide through the App Store in the Photography category (50% discount until end of February 2017). For more information, please contact Oliver Dreer. Bern, Switzerland - Lakehorn AG is a software development company based in Bern, Switzerland. The company provides apps for all iOS platforms and the Mac, mainly focusing on apps for the aviation community. Our main product line AeroWeather has more than 1 million users. All Material and Software (C) Copyright 2017 Lakehorn AG. All Rights Reserved. Apple, the Apple logo, Mac OS X, iOS and Macintosh are registered trademarks of Apple Inc. in the U.S. and/or other countries. Other trademarks and registered trademarks may be the property of their respective owners.